Car And A Ford Truck. Yes I want to win $1MILLION! VIP Exclusive.yes I am repeating myself because I want to win,on October 26th. Thanks again PCH and Prize Partrol.God Bless. Yes I wish to win the 1Million cash prize and the 1000 a week for life it would be a dream come true for me and my family . PCH,Why all my Comments are awaiting Moderation? I don’t understand,Explain to me,Please! !Sorry for asking,But I just need to understand. $1,000,000.00 VIP Exclusive Prize!PCH Gwy,No,11812 on Oct 26 2018.
i would love love to wit it all!!!! I’m claiming 6 unique opportunities to win 6 unique prizes from this notice. Clint henderson September 30 2028 i claim entry for search 1 to win 2,500.00 a week forever plus 50.000 cash bonus. Yes I’m here searching and hoping better $1,000 a day for life and a new car would be a great prize to win and to be a Publishing Clearing House Prize winner that is a dream come true for me! 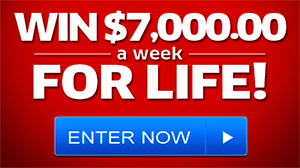 Yes I want to claim my 6XEntries To Win $2,500.00 A Week”Forever” Plus A Exclusive $1,000.00 Cash Prize! Then enter me in to Win It All $1,000,000.00 and $1,000.00 A Week For Life Plus A Brand New Ford Explorer($55,530.00)Thanks again PCH and Prize Partrol.God Bless.Yes I want to win on October 26th.! PCH I am claiming ownership and active entries to win 20 Cash Prizes Winners are Guaranteed every 15 minutes 9/19/18, GWY #. I want to win one of these prizes. PCH Imminent Winner Prize Funds Release Authorization, I am claiming ownership and active Full Eligibility to Secure an Incredible Forever Prize entries to win $2,500.00 a week forever prize, 10/26/18 GWY #11000. I want to win this prize. YesI want to win 2X Entries,to win Giveaway No.11000; $2,500.00 A Week Forever! Then enter me in to Win It All, $1,000,000.00 A $1,000.00 A Week For Life Plus A Brand New Car Ford Explorer($55,530.00).Thanks again PCH and Prize Partrol.God Bless.Yes I want to win and meet The Prize Partrol Team,in,Fleming Island,Florida,at,the McBride house,on,October 26th. Yes I want to win! Yes I would love to win the $1,000,000.00 Cash from PCH. Yes I want to win Giveaway No.18000;$1,000,000.00 Prize! Then enter me in to Win It All $1,000,000.00 A $1,000.00 A Week For Life and A Ford Explorer($55,530.00). Thanks again PCH and Prize Partrol.God Bless. WOW! $1,000,000.00 and $1,000.00 A Week For Life Plus A Brand New Ford Explorer($55,530.00). Thanks again PCH and Prize Partrol.God Bless.Yes I want to win! Yes I want to win the $1,000,000.00 With my 3 Chances entries. 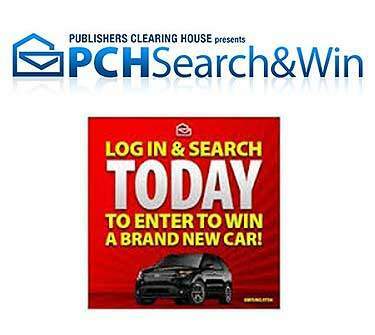 PCH Search & Win… I want to win $1,000.000.00 Life-Changing Fortune from (PCH Gwy. No.18000) on October 26, 2018. I claim my entry for award. Thank you. 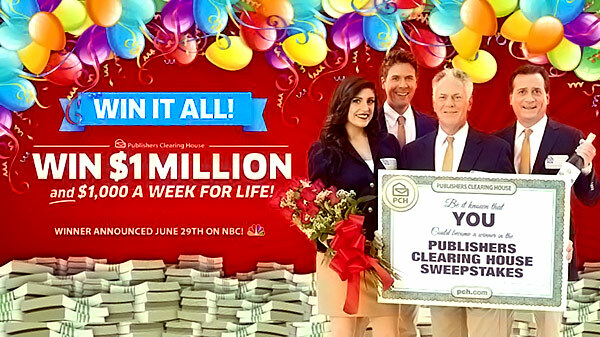 Yes I want to win,Giveaway No.11475;$25,000.00 New Car Cash! 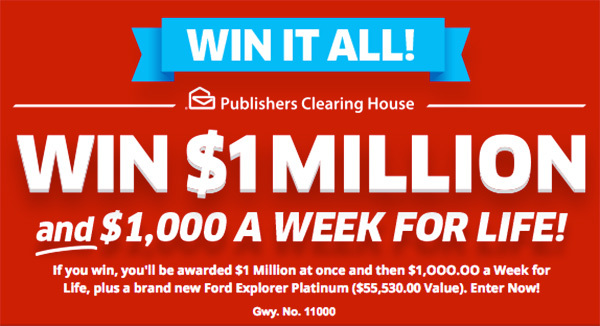 Then enter me in to Win It All; $1,000,000.00 and $1,000.00 A Week For Life,Plus A Brand New Ford Explorer($55,530.00)!WOW! Thanks again PCH and Prize Partrol.God Bless.Yes I want to win,on October 26th. It would be wonderful to be the winner of the VIP ELITE EXCLUSIVE REWARD. After working 63 yrs,=. (retired at age 80))it will give me security. Also, not only helping my family but to help the wounded soldiers, blinded Vets, “Smile Train” (children born with facial defects and needed surgeries), to donate to my faith, etc. I would like to win $2,000,000.00 plus $1,000.00 a day for life. It would be a dream comes true for me to enable to help the projects that’s in my mind other than helping myself (after working 63 yrs. and retired at age 80)& my family. PCH Frontpage. scheduled deliver for tomorrow I would love of Prize Patrol will travel to my house I am searching at PCH Frontpage before 11:59 pm on time because I want to win. If I’m selected the big winner tomorrow I would receive the amounth authorized $1.000.000.00 at once plus $1.000.00 a week for life from PCH Gwy 11000. Also I could win a Brand New Ford Explorer valued at $34.670.00 is up grabs from PCH Gwy 10074. Today I went out to some paperworks I lost my keys and I can not returned to my house I waiting for my daugher my celular phone out batery. Just Thinking. And that worried too I do not have anyone to celebrate with me I’ll continue with the hope of a better tomorrow that could change my life. i hope too this in your plan to select me as the Big winner. this amazing prize approved to deliver tomorrow June 29th. thanks. 11000 , at Stake Finalize my last step Received Notice to Complete Compliance.